What started as a small start-up in one of ABB’s business units almost a decade ago is now an integral part of the company’s innovative push for sustainable mobility. One innovation after another is coming from ABB developments in electric-vehicle (EV) chargers. Today, ABB's breakthrough e-mobility technologies are front-page news. 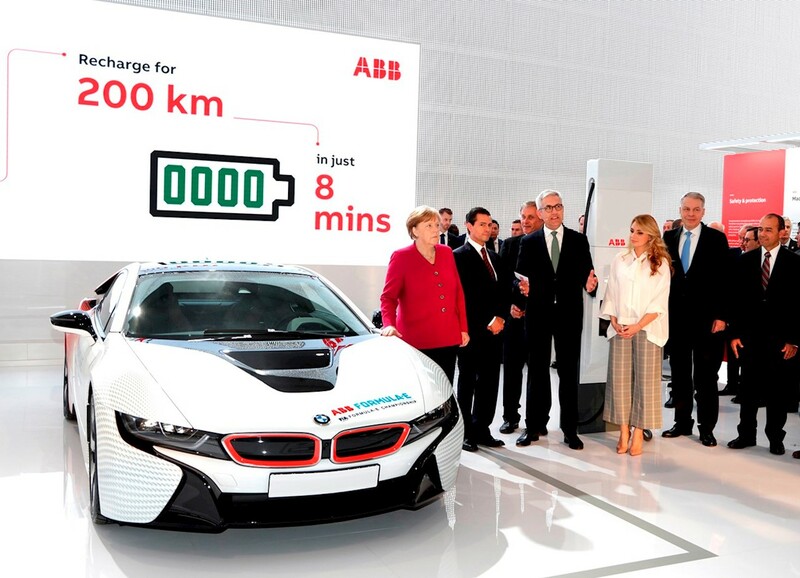 German Chancellor Angela Merkel and Mexican President Enrique Pena Nieto visited the ABB exhibit at the Hanover Fair to see the newly launched Terra High Power fast-charging station and hear about its impact on sustainable transport from ABB CEO Ulrich Spiesshofer. The Terra HP is the world’s fastest EV-charger, adding up to 200 kilometers of range to an electric vehicle in just eight minutes. With the number of electric vehicles on the road rising, the global demand for powerful and energy efficient vehicle charging stations is ever increasing. ABB EV-chargers, like the Terra High Power charger, are the driving force behind the efforts of nations to reach sustainability targets and charges have become a critical part of sustainability policies. With more than 7,000 DC fast charging stations installed in 60 countries, ABB is a global leader in that segment. The technology behind e-mobility is truly coming of age, which is also shown in ABB’s partnership with the ABB FIA Formula E Championship. ABB is bringing its name, innovation and technology leadership to the first fully electric motor sport series. 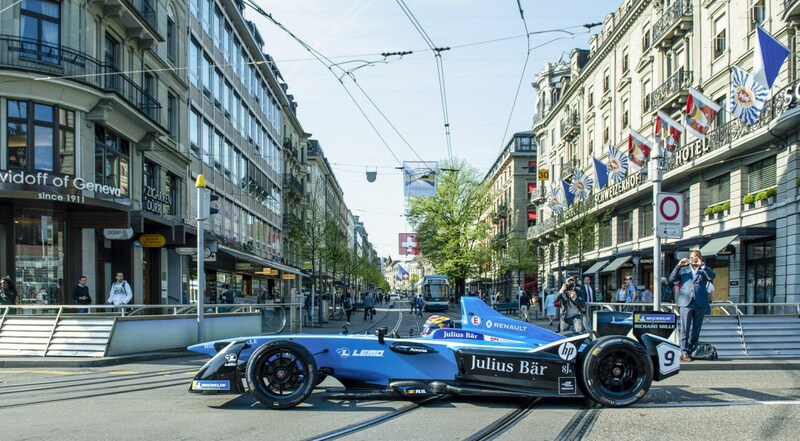 The ABB FIA Formula E Championship perfectly supports ABB’s belief that we can run the world without consuming the earth. The series’ next race will be in Zurich on June 10. The ascendance of sustainable mobility and the charging infrastructure required to keep electric vehicles moving is evident by the increasing number of ABB EV charging projects around the world. German energy supplier EnBW alone has 185 EV fast chargers on German motorways and in April, ABB was selected to supply its Terra HP charging stations as part of the biggest electric vehicle infrastructure project to date in the United States. The chargers were selected for deployment by Electrify America, which plans to place hundreds of charging stations within and around 17 metropolitan areas and along multiple nationwide highway corridors. The chargers are an important element, for example, in Iceland’s ambitious plan to increase the adoption of renewable energy. While fossil fuels still account for 20 percent of overall energy usage, the Icelandic government has put in place a state-financed incentive program to increase the use of electric vehicles. It is already having an impact—today there are more than 6,000 e-cars, compared to a scant 90 in 2014. To power these e-cars, more than 20 ABB fast charging stations have been installed along Iceland's famous Route 1, the 1,300+ kilometer road that's the country's main highway and its logistical backbone. ABB has also delivered six 350kW fast chargers in Switzerland, the first with liquid-cooled cables in Europe, as part of the IONITY initiative to open highway "fuel" stations of the future at 400 sites across Europe by mid-2019. IONITY is a company joint venture of BMW Group, Daimler AG, Ford Motor Company and VW Group, with Audi and Porsche. This first site in Switzerland was planned, engineered and built by Alpiq, a leading energy company in Switzerland and the largest energy service provider with focus on European markets. ABB Ability™ technology guarantees that the chargers are operational 24/7. Remote digital connectivity enables continuous monitoring of the device from any location. This gives access to data in real time for the remote monitoring and proactive control of the operational and technical status of the charging stations. ABB’s charging technologies for electric cars, buses and trucks, as well as solutions for the electrification of ships, railways and cableways, firmly establishes it as a global champion in e-mobility and sustainable transportation. It is playing a crucial role in the fight against climate change as e-mobility begins to replace fossil-fuel-powered vehicles, which contribute to global warming. ABB’s fast-chargers help to pave the way for a quick adoption of electric vehicles, which are increasingly becoming more attractive and less expensive to buy and maintain. As policy makers across the world promote sustainable transport solutions ABB will continue to be at the forefront to develop a greener future for all.